In 1906 Samuel Clemens (Mark Twain) purchased 195 acres of land in Redding, Connecticut. Then, after his story Captain Stormfield’s Visit to Heaven was sold, he decided to add a house on the property. He hired the architect John Mead Howells to build him a home in the Italian style, calling it “Innocents At Home,” a tribute to his wildly successful book Innocents Abroad. Clemens’s fond memories of a winter vacation in Florence with his family influenced the design and his secretary, Isabel Lyon, furnished the house with Clemens’s favorite things—including his billiard table and cats. The house was finished in 1908 and christened “Stormfield,” possibly inspired by a storm that autumn or, more likely, after the financial contribution Captain Stormfield made to its construction. The house and its author attracted many visitors, and Clemens, who felt the town needed a library, took advantage of this by often demanding a contribution from his male guests. Clemens curious campaign is documented by a sign asking for at least a $1.00 which is now on display at the Mark Twain Library in Redding. Thomas Edison’s visit to Stormfield is also documented by this silent film he produced in 1909. 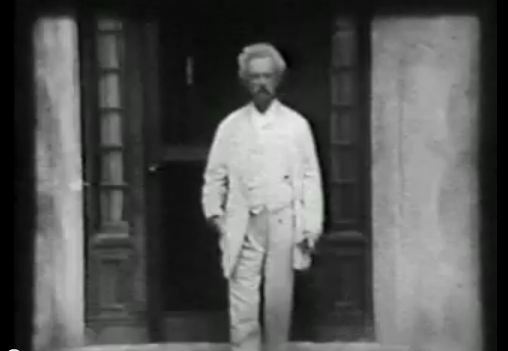 This rare footage is thought to be the only film of Clemens and it shows him wearing his classic white suit, puffing on a cigar, as he walks around the estate. Samuel Clemens died only a year later on April 21, 1910, in Redding. As for Stormfield, it burned to the ground in 1923. Twain, Mark. Extract from Captain Stormfield’s Visit to Heaven. New York; London: Harper & Brothers, 1909. Link. Twain, Mark. The Innocents Abroad, or, the New Pilgrims’ Progress: Being Some Account of the Steamship Quaker City’s Pleasure Excursion to Europe and the Holy Land: With Descriptions of Countries, Nations, Incidents, and Adventures as They Appeared to the Author. Hartford, CT: American Publishing Company, 1871. Link.